Price: $55,000.00 USD as is or $85,000.00 with 2 freshly overhauled engines. 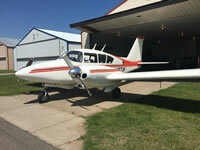 STC-SA 597SW-Miller Extended Nose Kit S/N 211-provides airframe modifications to match later production Aztec models. STC-SA339SW-Howard Research & Development Electric Hydraulic Pump for backup to Engine Driven Pump for Landing Gear & Flap Operation. This aircraft is one of the last few Apaches built by Piper in 1963 and during this period the Aztec was also in production. The Apache had 235 HP engines & five seats, while the Aztec had 250 HP engines & five seats. This aircraft is registered as an Apache but configured with 250 HP engines. All other aspects between the two models are minimal, therefore the owner refers to the plane as an Aztec. The plane has been thoroughly restored to airworthy condition, following a period of non-use. Hanger stored since restoration completion. Condition of this aircraft is excellent with extensive documentation available upon request. © 2009 Our Company. All rights reserved.